A prop is simply a drawing layer that has been marked as a prop. To make sure it follows its anchor's animation, it must be either rigged as a child or a sibling of the anchor in the rig hierarchy. A prop can have one or several drawings. All drawings in a prop will be exported with your character, and it will be possible to switch between the different drawings for your prop in Unity. Select the anchor layer to which you want your prop to be attached. In the Add Drawing Layer dialog, type in a name for your prop layer. The prop layer will be created as a sibling to the anchor layer you previously selected. 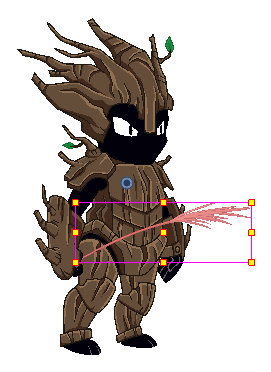 If you animate the anchor layer's parent peg, the prop will also move along with it. In the Timeline view, select the first frame of the prop layer. In the Game toolbar, click on Toggle Prop. The layer will now be a prop layer. 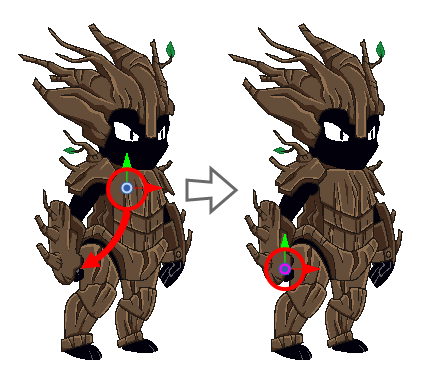 Its colour in the Timeline view will be changed to green. You can now start drawing your props in the prop layer. TIPYou can create several drawings in a single prop layer. You will get to toggle between those drawings after attaching the prop to the anchor in Unity.